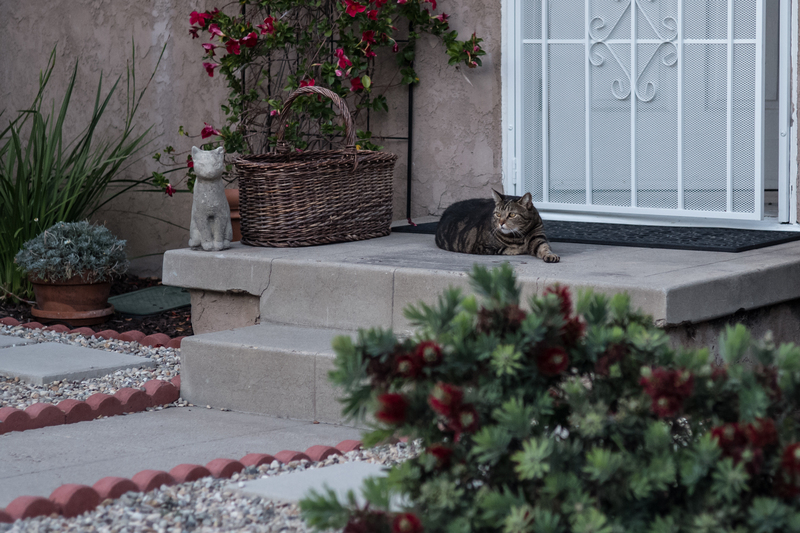 For Caturday, we celebrate with the second Lucy to appear in the series ( although I later learned that the first, who lives on Georgia Street, is spelled with an “i”, not “y”). My wife and I met her near-namesake on Florida, between Meade and Mission, last night. The 9-year-old beauty has a stub tail and sweet demeanor. You can’t not like her. Lucy adopted her eventual caretaker, when the woman worked for a consignment shop. 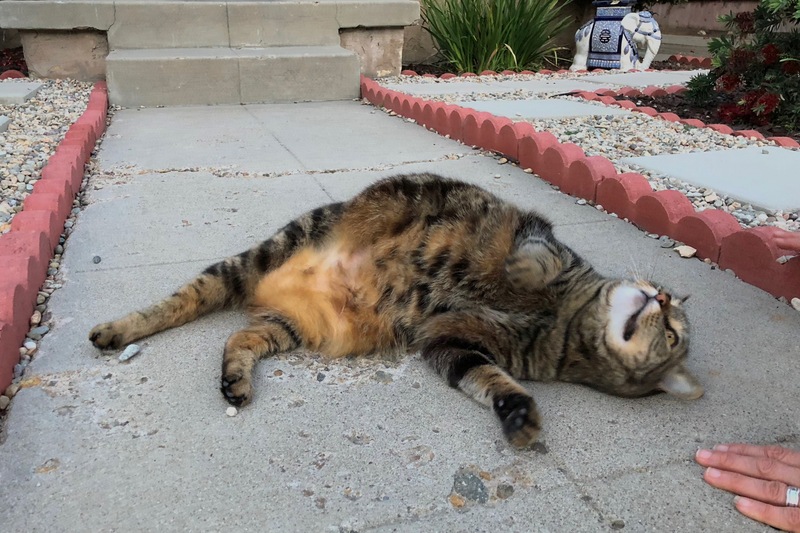 The stray came around and grew friendlier until she was transplanted from North Park business to University Heights residence—where she stayed without fuss. Lucy sticks pretty close to home, which isn’t surprising for a matronly kitty who chose her owner. I captured the Featured Image and first companion using Leica M10 and Summarit-M 1:2.4/50 lens, with ISO manually set to 1600. Other vitals for the first: f/2.4, 1/250 sec, 50mm; 7:30 p.m. PDT—or three minutes before sunset. The second, shot 120 seconds later, is same except for 1/180 sec. The last portrait comes from iPhone X, at 7:34 p.m. Vitals: f/1.8, ISO 64, 1/15 sec, 4mm. There is some motion blur because of the slow shutter speed. Don’t miss: Scruffy, Roly Poly, Woo, Skull, Biscuit, The Colonel, White, Chipper, Frisky, Stretch, Needy, Farfisa, Mates, Hunter, Pee-Pee, Blue, Blue Too, Bonded Pair, Patience, Fess, Jumper, Frenemy, Looker, Cozy, Scout, Lurks, Skit, Mini, Betty, Black and White, Stalker, Bell, Chill, Sammy, Scratch, Poser, Star, Grey and White, Watcher, Herman, Comet, Roman, Willow, Chub, Nimbus, Watson, Lilo, Kit, Pepe, Twilight, Sebastian, Spot, Booger, Ash, Veruca, Riley, Mellow, Bonde, Flower, Glass, Black, BeBe, Fang, Bruce, Siamese, Pounce, Tortie, Haiku, Fraidy, Peso, Daniel Tiger, Dusk, Stride, Dainty, Spry,Tabby, Betty Too, Still, Levi, Shadow, Sophie, Wink, Ferals, Momma, Charlie, Tux, Cool, Benny, Jellicle, Itchy Valentino, Goldie, Nine, Amanda, Siesta, ChaCho, Charlie, Too, Mika, Crystal, Seeker, Mittens, Dancer, Smokey, Monkey, Captain Blackbeard, Season, Maven, Tink, Chunk, Curious, Hanoi, Bella, Tarry, Guido, Maxine, Mr. Kitty, Peohe, Panda, Frankie, Sunshine, Twain, Willow, Too, Brawn, Reddy, Burglar, Laramie, Lupe, Bright, Tom, Charm, Buddies, Boss, Ohana, Seer, Fresh, Token, Lola, Carl, Bramble, Finny, Cal, Tipsy, Zander, Mew, Penny, Charlie (the Third), Bob, Apple, Persepolis, Sebastian, Too, Holiday, Snow, Desire, Luci, Torbie, E.T., Bushy, Cali, Precious, Gracie, STAR, Sky, Amble, Aylin, Lucky, Herbie, The Love Bug, Roadie, Harley, Wonder, Dizzy, and Moophie.